A supervolcano refers to a volcano that produces the largest and most voluminous kinds of eruption on Earth. The actual explosivity of these eruptions varies, but the sheer volume of extruded magma is enough to radically alter the landscape and severely impact global climate for years, with a cataclysmic effect on life (see also nuclear winter). The term was originally coined by the producers of the BBC popular science program, Horizon, in 2000 to refer to these types of eruption. That investigation brought the subject more into the public eye, leading to further studies of the possible effects. At first, supervolcano was not a technical term used in volcanology, but more recently, in 2003 and 2004, the term has been used in articles. Though there is no well-defined minimum explosive size for a "supervolcano", there are at least two types of volcanic eruption that have been identified as supervolcanoes: massive eruptions and large igneous provinces. A large igneous province (LIP) is an extensive region of basalts on a continental scale, resulting from flood basalt eruptions. When created, these regions often occupy several million km² and have volumes on the order of 1 million km³. In most cases, the majority of this is laid down over an extended but geologically sudden period of less than 1 million years. Eruptions with a Volcanic Explosivity Index of 8 (VEI-8) are mega-colossal events that extrude at least 1000 km³ of magma and pyroclastic material. Such an eruption would erase virtually all life within a radius of hundreds of kilometers from the site, and entire continental regions further out can be buried meters deep in ash. VEI-8 eruptions are so powerful that they form circular calderas rather than mountains because the downward collapse of land at the eruption site fills emptied space in the magma chamber beneath. The caldera can remain for millions of years after all volcanic activity at the site has ceased. Satellite image of Lake Toba. VEI-8 volcanic events have included eruptions at the following locations. Estimates of the volume of erupted material are given in parentheses. The Lake Toba eruption plunged the Earth into a volcanic winter, eradicating an estimated 60%    of the human population, and was responsible for the formation of sulfuric acid in the atmosphere and the Millennial Ice Age. Many other supermassive eruptions have also occurred in the geological past. Those listed below measured 7 on the VEI scale. Most of these were larger than Tambora's eruption in 1815, which was the largest eruption in recorded history. For large flood basalt eruptions, see large igneous province. A two-part television docudrama entitled Supervolcano was shown on BBC, the Discovery Channel, and other television networks worldwide. It looked at the events that could take place if the Yellowstone supervolcano erupted. It featured footage of volcano eruptions from around the world and computer-generated imagery depicting the event. According to the program, such an eruption would have devastating effect across the globe and would cover virtually all of the United States with at least 1 cm of volcanic ash, causing mass destruction in the nearby vicinity and killing plants and wildlife across the continent. The dramatic elements in the program were followed by Supervolcano: The Truth About Yellowstone, a documentary about the evidence behind the movie. The program had originally been scheduled to be aired in early 2005, but it was felt that this would be insensitive so soon after the 2004 Indian Ocean earthquake. The program and its accompanying documentaries were released on DVD region 2 simultaneously with its broadcast. A National Geographic documentary called Earth Shocks portrayed the destructive impact of the rapid eruption of Lake Toba some 75,000 years ago and caused a phenomenon known as the Millennial Ice Age that lasted for 1000 years and wiped out more than 60%     of the global population of the time. An eruption of the Yellowstone supervolcano was originally one of the scenarios depicted in the docu-drama End Day, but was excluded from all airings to date for unknown reasons and is only presently mentioned at the show's BBC website. A volcanic winter is the reduction in temperature caused by volcanic ash and droplets of sulfuric acid obscuring the sun, usually after a volcanic eruption. The causes of the bottleneck phenomenon, i.e., a sharp decrease in a species' population immediately followed by a period of great genetic divergence (differentiation) among survivors—might be attributed to volcanic winters. According to anthropologist Stanley Ambrose, such events diminish the population size to "levels low enough for evolutionary changes, which occur much faster in small populations, to produce rapid population differentiation". A terrific case of volcanic winter happened around 71,000–73,000 years ago following the supereruption of Lake Toba on Sumatra island (Indonesia). In the following 6 years there was the highest amount of volcanic sulphur deposited in the last 110,000 years, possibly causing complete deforestation in Southeast Asia and the cooling of sea temperatures by 3–3.5°C. Remarkably, the eruption almost caused an instant Ice Age on Earth by accelerating the glacial shift that already was going on, therefore causing massive population reduction among animals and human beings on Earth. This, combined with the fact that most human differentiations abruptly occurred at that same period, is a probable case of bottleneck linked to volcanic winters (see Toba catastrophe theory). On average, such super-eruptions and subsequent volcanic winters occur on our planet every 50,000 years. The scales of recent winters are more modest but their effects can be significant. A paper written by Benjamin Franklin in 1783 blamed the unusually cool summer of 1783 on volcanic dust coming from Iceland, where the eruption of Laki volcano had released enormous amounts of sulfur dioxide, resulting in the death of much of the island's livestock and a catastrophic famine which killed a quarter of the population. Temperatures in the northern hemisphere dropped by about 1°C in the year following the Laki eruption. The 1815 eruption of Mount Tambora, a stratovolcano in Indonesia, occasioned mid-summer frosts in New York State and June snowfalls in New England in what came to be known as the "Year Without a Summer" of 1816. In 1883, the explosion of Krakatoa (Krakatau) also created volcanic winter-like conditions. The next four years after the explosion were unusually cold, and the winter of 1888 was the first time snow fell in the area. Record snowfalls were recorded worldwide. Most recently, the 1991 explosion of Mount Pinatubo, another stratovolcano, in the Philippines cooled global temperatures for about 2-3 years, interrupting the trend of global warming which had been evident since about 1970. MR Rampino, S Self & RB Stothers (1988). "Volcanic winters". Annual Review of Earth and Planetary Science 16: 73-99. DOI:10.1146/annurev.ea.16.050188.000445. Lake Toba (Indonesian: Danau Toba) is a large lake, 100 km long and 30 km wide, in the middle of the northern part of the Indonesian island of Sumatra with a surface elevation of about 900 m (3000 feet), stretching from 2.88° N 98.52° E to 2.35° N 99.1° E.
In 1949 the Dutch geologist Rein van Bemmelen reported that Lake Toba was surrounded by a layer of ignimbrite rocks, and that it was a large volcanic caldera. Later researchers found rhyolite ash similar to that in the ignimbrite around Toba (now called Young Toba Tuff to distinguish it from layers deposited in previous explosions) in Malaysia and India, 3000 km away. Oceanographers discovered Toba ash, with its characteristic chemical "fingerprint", on the floor of the eastern Indian Ocean and the Bay of Bengal. Location of Lake Toba shown in red on map. The Toba eruption (the Toba event) occurred at what is now Lake Toba about 71,500 ± 4000 years ago. It had an estimated Volcanic Explosivity Index of 8 (described as "mega-colossal"), making it possibly the largest volcanic eruption within the last two million years. Bill Rose and Craig Chesner of Michigan Technological University deduced that the total amount of erupted material was about 2800 cubic km (670 cubic miles) — around 2000 km³ of ignimbrite that flowed over the ground and around 800 km³ that fell as ash, with the wind blowing most of it to the west. By contrast, the 1980 eruption of Mount St. Helens ejected around 1 cubic km of material, whilst the largest volcanic eruption in historic times, at Mount Tambora in 1815, emitted the equivalent of around 100 cubic kilometres of dense rock and created the "Year Without a Summer" as far away as North America. The Toba eruption was the last of a series of at least three caldera-forming eruptions which have occurred at the volcano. Earlier calderas were formed around 700,000 and 840,000 years ago. To give an idea of its magnitude, consider that although the eruption took place in Indonesia, it deposited an ash layer approximately 15 cm (6 in) thick over the entire Indian subcontinent; at one site in central India, the Toba ash layer today is up to 6 m (20 feet) thick and parts of Malaysia were covered with 9 m of ashfall. In addition it has been calculated that an amount of 1010 metric tons of sulphuric acid was ejected into the atmosphere by the event, causing acid rain fallout. The subsequent collapse formed a caldera that, after filling with water, created Lake Toba. The island in the southern part of the lake is formed by a resurgent volcanic dome. Though the year can never be precisely determined, paradoxically the season can: only the summer monsoon could have deposited Toba ashfall in the South China Sea, implying that the eruption took place sometime during the northern summer The eruption lasted perhaps two weeks, but the ensuing "volcanic winter" resulted in a decrease in average global temperatures by 3 to 3.5 degrees Celsius for several years. Greenland ice cores record a pulse of starkly reduced levels of organic carbon sequestration. Very few plants or animals in southeast Asia would have survived, and it is possible that the eruption caused a planet-wide die-off. There is some evidence, based on mitochondrial DNA, that the human race may have passed through a genetic bottleneck within this timeframe, reducing genetic diversity below what would be expected from the age of the species. According to the Toba catastrophe theory proposed by Stanley H. Ambrose of the University of Illinois at Urbana-Champaign in 1998, human populations may have been reduced to only a few tens of thousands of individuals by the Toba eruption. Smaller eruptions have occurred at Toba since. The small cone of Pusukbukit has formed on the southwestern margin of the caldera and lava domes. The most recent eruption may have been at Tandukbenua on the northwestern caldera edge, since the present lack of vegetation could be due to an eruption within the last few hundred years . 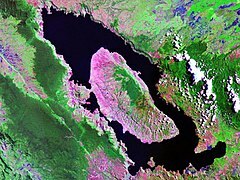 Some parts of the caldera have experienced uplift due to partial refilling of the magma chamber, for example pushing Samosir Island and the Uluan Peninsula above the surface of the lake. The lake sediments on Samosir Island show that it has been uplifted by at least 450 metres  since the cataclysmic eruption. Such uplifts are common in very large calderas, apparently due to the upward pressure of unerupted magma. Toba is probably the largest resurgent caldera on Earth. Large earthquakes have occurred in the vicinity of the volcano more recently, notably in 1987 along the southern shore of the lake at a depth of 11 km. Other earthquakes have occurred in the area in 1892, 1916, and 1920-1922. Lake Toba lies near a fault line which runs along the centre of Sumatra called the Sumatra Fracture Zone . The volcanoes of Sumatra and Java are part of the Sunda Arc, a result of the northeasterly movement of the Indo-Australian Plate which is sliding under the eastward-moving Eurasian Plate. The subduction zone in this area is very active: the seabed near the west coast of Sumatra has had several major earthquakes since 1995, including the 9.3 2004 Indian Ocean Earthquake and the 8.7 2005 Sumatra earthquake, the epicenters of which were around 300 km from Toba. According to the Toba catastrophe theory, modern human evolution was affected by a recent, large volcanic event. The theory was proposed by Stanley H. Ambrose of the University of Illinois at Urbana-Champaign. Within the last three to five million years, after human and other ape lineages diverged from the hominid stem-line, the human line produced a variety of human species. According to the Toba catastrophe theory, a massive volcanic eruption severely reduced the human population. This may have occurred when around 70–75,000 years ago the Toba caldera in Indonesia underwent an eruption of category 8 (or "mega-colossal") on the Volcanic Explosivity Index. This released energy equivalent to about one gigaton of TNT, three thousand times greater than the 1980 eruption of Mount St. Helens. According to Ambrose, this reduced the average global temperature by 3 to 3.5 degrees Celsius for several years and may possibly have triggered an ice age. Ambrose postulates that this massive environmental change created population bottlenecks in the various species that existed at the time; this in turn accelerated differentiation of the isolated human populations, eventually leading to the extinction of all the other human species except for the two branches that became Neanderthals and modern humans. Some geological evidence and computed models support the plausibility of the Toba catastrophe theory, and genetic evidence suggests that all humans alive today, despite their apparent variety, are descended from a very small population, perhaps between 1,000 and 10,000 individuals . Using the average rates of genetic mutation, some geneticists have estimated that this population lived at a time coinciding with the Toba event (see also Mitochondrial Eve and Y-chromosomal Adam). According to this theory, humans once again fanned out from Africa after Toba when the climate and other factors permitted. They migrated first to Indochina and Australia, and later to the Fertile Crescent and the Middle East. Migration routes to Asia created population centers in Uzbekistan, Afghanistan, and India. Possibly substantial differences in skin color appeared as a result of varied melanin levels as local adaptations to varying ultraviolet intensities. Europe became populated by migrants from the Caspian Sea region when the last ice age ended and Europe became more hospitable. ^ Stanley H. Ambrose (1998). "Late Pleistocene human population bottlenecks, volcanic winter, and differentiation of modern humans". Journal of Human Evolution 34 (6): 623–651. DOI:10.1006/jhev.1998.0219. The geysers, hot springs, and bubbling mud pots of Yellowstone National Park indicate there is extra heat beneath this corner of Wyoming. Geologists and volcanologists think the heat is from a hot spot beneath Yellowstone. A long line of features that extends to the west from Yellowstone are interpreted to be the track left in the continent from the hotspot. Most of these features are part of the Snake River Plain. The Snake River Plain extends 400 miles (650 km) westward from northwest Wyoming to the Idaho-Oregon border. The Snake River Plain is a broad, flat arcuate depression which is concave to the north and covers one quarter of the state of Idaho. Elevations on the Snake River Plain decrease from the east (4,400-5,000 feet; 1,350-1,525 m) to the west (2,950-3,900 feet; 900-1,200 m). Some features within the Snake River Plain become younger to the east. For example, calderas become progressively younger from west to east. The Yellowstone calderas are they youngest and mark the approximate location of the hotspot. Yellowstone has had three very large eruptions in the last 2 million years. During each event, a large volume of rhyolite magma was erupted from a shallow level in the crust and a large caldera formed. These eruptions occurred 2.0, 1.3, and 0.6 million years ago. The volume of lava erupted makes the 1980 eruption of Mount St. Helens look very small. Seismologists, scientists that study earthquakes, think they have detected the path the magma follows from the hot spot to shallow levels beneath Yellowstone. They used earthquake waves. The waves travel fastest in cold, dense rock. In warmer, less dense rocks, the waves slow down. A zone of warmer rocks has been mapped beneath Yellowstone.